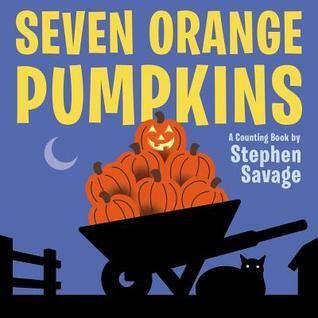 Halloween is not my favorite holiday — something about kids begging for candy doesn’t exactly get me excited — so I was happy to find “Seven Orange Pumpkins,” by Stephen Savage, has little to do with the candy aspect and more with the symbols associated with Halloween. “Seven Orange Pumpkins” — which has been adapted from Savage’s “Ten Orange Pumpkins” for younger readers, is a rhyming countdown featuring a sneaky spider, wily witch, silly scarecrow and other spooky creatures. Each of the creatures plays a part in making the pumpkins disappear. Savage’s illustrations are bright and simple. He utilizes silhouettes to create drama and bolster imagination. My daughter particularly enjoyed the addition of a black cat on each page. At 20 months, she loves looking for, and finding, repetitive items throughout books. Though this is specifically a Halloween book, I plan to keep it in our normal rotation as the counting elements are something we enjoy no matter the season.